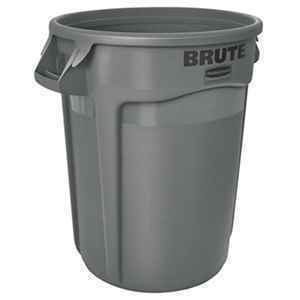 Rubbermaid Commercial BRUTE 32 Gallon refuse can. Professional-grade construction will not rust, chip or peel and resists dents. Reinforced rims add strength and durability. Innovative venting channels make lifting out liners up to 50 percent easier. Improving productivity and reducing the risk of injury. Integrated cinches secure the liner, allowing for efficient knot free liner changes. Proprietary design constructed with the highest quality material plus a UV inhibitor ensures long life. Contoured base handles improve grip and ergonomics, reducing strain and improving efficiency.